Sidney Callahan has written a wonderful piece for NCR from her vantage point of 79 years of life, titled My days with the other old yoga ladies. My appreciative range for bodies has extended far beyond my habitual baby worship. Who can resist plump little hands and feet, miniature ears, big eyes and rounded foreheads? Our delight in babies arises from the promise of their future. With an aging woman’s body, it is the marks of past living that appeal. Engraved on the faces, figures and hands are decades of experiences undergone. Think here of the aesthetic appeal of old houses and antique silver and furniture. A distressed finish and a well rubbed-patina attract our eyes. Fading flowers and autumn leaves manifest beauty. Trees filled with moss or gnarled by winds express variety. On the Maine coast we wonder at Earth’s history in the eroded rocks. My own Mama, Irena Sliwinski, is a model and mentor of the giftedness of life after fifty. She didn’t begin painting seriously until she was my age. Today, she is an accomplished artist with her art hanging all over the world. She has sold over 200 pieces, and our own home is graced with some of her finest. 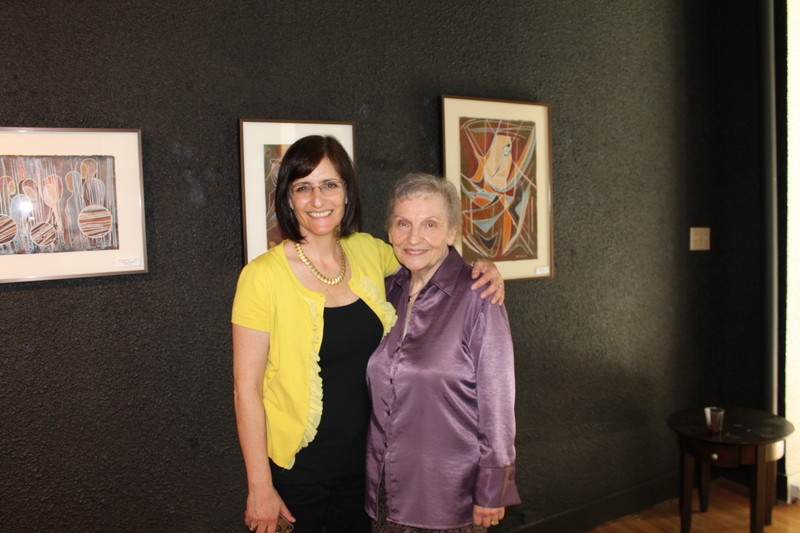 This past weekend, we attended the opening for yet another art show of her works at the Fleet Gallery in Winnipeg. Last week, the Interlake Spectator highlighted her in an insightful article about her journey as an artist. At 77 years of age, Mama continues to create and reflect beauty. An inspiration indeed! Old age is not a punishment but a victory! We are becoming a natural monastery! Diminishments of our senses with aging, the loss of vision, loss of hearing, loss of sense of smell are a call to interiority. What does this loss of the senses say not about our vulnerability but about but our need to live from within? There are other levels of the senses that we may not have been attuned to: our intuition, our deeper feelings, and our desires are there interior sense that are awakened by the losses of the outer senses? If we believe in the paschal mystery that out of loss and death comes life, and life in abundance, how is this gradual loss and deprivation of senses of the an invitation to us to profoundly and intuitively recognize that my life and consciousness is moving to a new arena and a new level? Are we being invited to go to a mysterious place where God dwells? Is there an inner eye, an inner vision, and inner hearing, and inner way of feeling that compensates for the external losses? Are the signs of aging really a call to contemplative life? Ah….and out of the contemplative life bursts forth creativity. Thanks for this, Ray. Thank you, Isabella for sharing your mama with us. She certainly is an inspiration to me as I begin my journey into my 70’s. She is the kind of woman (model) I would enjoy meeting. If she wants to move from cold Winnepeg to warm Florida, I know of a lovely cottage she can buy. was touched by the piece she was holding in that. Many more years of love and creativity for Irena! Haha….no way I’d let her move to Florida, Chris. I like having her right where she is! And by the way, when I read Sidney Callahan’s wonderful article I thought of my favorite yoga enthusiast. You are living proof that it melts the years away and magnifies the peace and wisdom within. Here is a link to more of my Mama’s art! I love this post Isabella! Thank you for this reminder of the beauty of years.